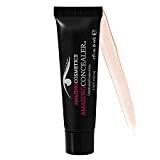 What it is:A miniature-size, multipurpose concealer.What it does: AmazingCosmetics AmazingConcealer To Go is a highly pigmented, super-emollient, waterproof formula that blends seamlessly into the skin, creating a flawless complexion that looks and feels natural. Hollywood"s hottest makeup artists depend on the AmazingConcealer to create the picture-perfect complexions their celebrity clients have come to expect. The first step in the AmazingCosmetics "complexion perfection" process, the AmazingConcealer erases dark circles, blemishes, broken capillaries, sun damage, and redness with only tiny amounts of the product.What else you need to know:AmazingCosmetics AmazingConcealer To Go is paraben-free.